Twitter’s announced that it’s moving a lot of stuff to Google’s cloud, but it’s not all good news for Google. The avian network has announced that “cold data storage and our flexible compute Hadoop clusters” are off to Google. 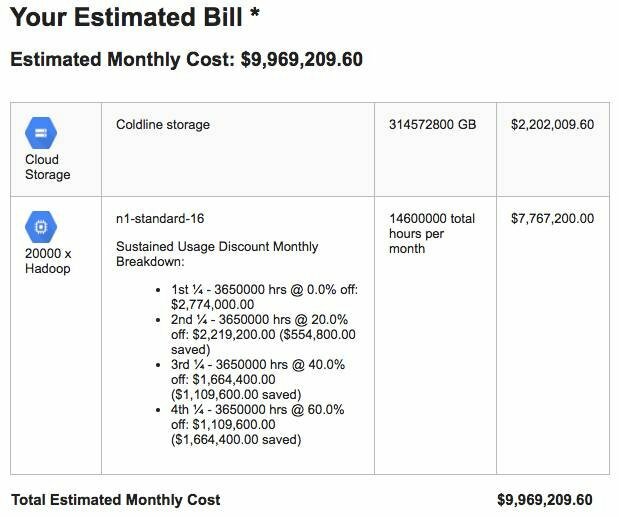 That announcement mentions “more than 300PB of data across tens of thousands of servers”, so The Register fed Google’s handy cloud price calculator 300PB of cold storage and 20,000 mid-range servers. The Register imagines that Twitter will pay nowhere near the US$9,969,209.60 quoted: Google’s known to covet and pursue big customers. It’s doubtless happy to have a 300PB-and-thousads-of-servers client aboard. But this isn’t total victory for Google. We know this because when Twitter recently revealed details of its infrastructure it detailed “tens of thousands of hosts” for various applications that and the fact that Twitter ran some of its Apache Mesos and Aurora implementations in AWS. Google therefore appears to have won a slice of Twitter’s business, but there’s plenty more Twitter infrastructure elsewhere, too. And that infrastructure, not Hadoop, is what does the Tweeting. Google’s therefore won some business that’s doubtless important, but probably isn’t life or death for the Twitter service. To further dampen the joy for Google, multi-cloud strategies are now utterly ordinary. Organisations are routinely advised not to put all their eggs in one cloudy basket, but instead to shop around and buy the stuff that makes most sense to them regardless of which cloud offers it.